volunteer effort in what the company said was a powerful representation of its year-round commitment to community service. What started with 6,100 volunteers in 2001 in one city has now grown to more than 100,000 volunteers this year at over 1,000 sites in about 20 countries. In the Twin Cities area, more than 2,000 local Comcast employees and their families, friends and community partners made “make change happen” as they volunteered at more than a dozen project sites across the metro area as part of the 17th annual Comcast Cares Day. This year’s volunteers were also a part of a significant milestone of Comcast Cares Day – reaching 1 million volunteers since the program began in 2001. Comcast volunteers helped clean, paint and restore a variety of project sites around the Twin Cities. 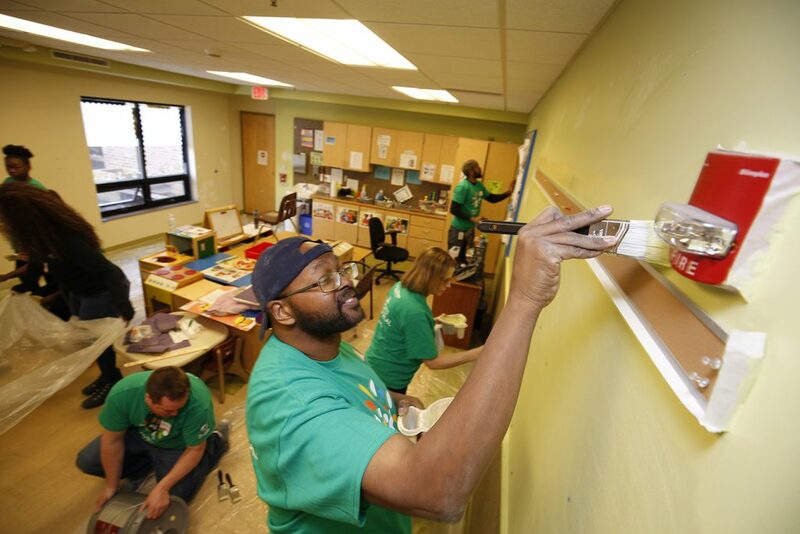 One of the beneficiaries was the Phyllis Wheatley Community Center in Minneapolis where they helped give the center get a fresh coat of paint. Gamble Boys & Girls Club, Haven House – Ascension Place, and Pillsbury United Communities also were beneficiaries of the Comcast Cares volunteers. Caruso’s organization has played a key role in helping Comcast coordinate its many volunteer project locations across the Twin Cities. She added that the volunteers would have a lasting impact.